You'll be £25.00 closer to your next £10.00 credit when you purchase Britain and Victory in the Great War. What's this? Peter Liddle, compiler and editor of this themed essay collection, uses a slightly provocative title to remind us that Britain fought in a coalition and was not always the senior partner. A very though provoking book. This book is essential reading for anybody researching into or writing about WW1 and will be rewarding for all other readers. 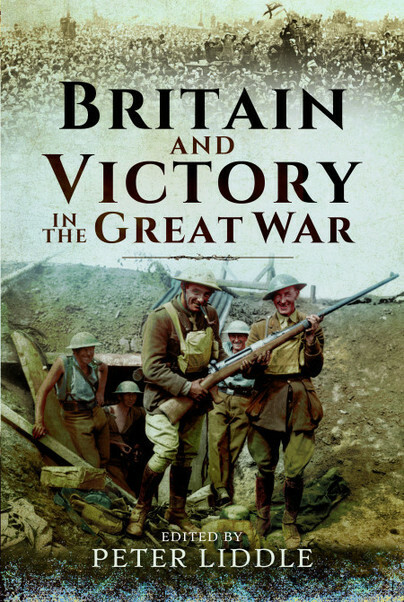 It is the third volume of a trilogy published by Pen & Sword, the others being Britain Goes to War and The Widening War. However, Britain and Victory is far from being exclusively about the final stage of the war or being exclusively about Britain. The book consists of 21 separate essays by leading historians; two of the contributions are about Germany, and there is one each on Russia, France, the USA, Italy and the Commonwealth. They vary greatly in theme (military, social, economic, political) and their time frames. ‘Women and the Great War’, for instance, covers the whole war while ‘That Quiet Place’ concerns how the war was memorialised from 1917 to the present. An insightful set of essays on a broad range of war related themes. A solid read and is recommended. This is a thought-provoking collection of well-written essays by Great War scholars. The trilogy has added greatly to the sum of available knowledge and challenged a number of previously accepted conclusions. This final edition in the trilogy is an important work for enthusiasts, professionals and novices alike. Gallipoli, The Somme and D-Day. He is dedicated to the preservation of the evidence of the past and has particularly enjoyed drawing together in publications and conferences the research of others in the field.. He has a lifetime of interest in sport, history travel and wildlife. He lives with his wife, Louise, in Rawdon, Leeds. He is Life President of The Second World War Experience Centre.